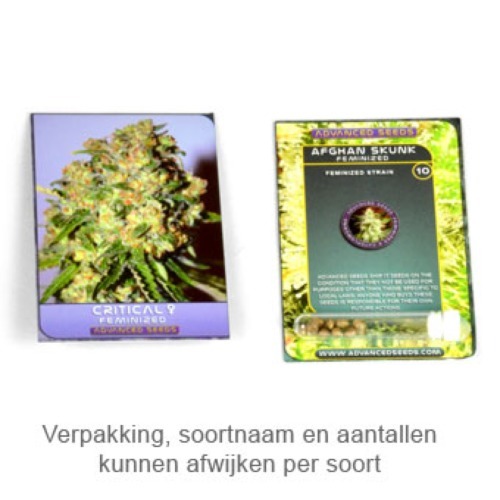 Kaya 47 from Advanced Seeds are feminised cannabis seeds. This weed strain is mainly Sativa and is a hybrid with Thai, Colombian, Afghan and Mexican genetics. Her yield is bigger in comparison with her origin: the AK47. Her flowering time is also shortened. Advanced Seeds Kaya 47 is very appropriate for an indoor grow, but also outside this plant will perform well in a not too wet summer. This strain becomes medium high and develops a nice central top. Growing cannabis from these feminised cannabis seeds is not difficult and give you a strong and nice weed. Tell us and our customers what you think of the Kaya 47 from Advanced Seeds.